Tall Oil Fatty Acid Market size excceded USD 800 million in 2015, and will grow at a CAGR over 4%. Rising product demand as lubricant, viscosity modifier, and corrosion inhibitor in the oilfield industry will boost the global tall oil fatty acid market in coming years. According to U.S. Energy Information Administration, U.S. petroleum production increased from less than 6 million barrels per day in 2011 to over 9 billion barrels per day in 2015 owing to increased consumption from automobiles, aircrafts, as well as industrial activities. Middle East countries including Saudi Arabia, UAE, Kuwait, Iran, Iraq accounted for more than a quarter of the global petroleum production and it will increase several folds in the forecast spell. Growing preference of plant derived chemicals over animal derived products will further enhance the overall market demand in the next few years. Low market penetration and a considerable lack of awareness in the emerging nations of Asia Pacific detergents industry, which accounts for a significant chunk of the global tall oil fatty acid market, may hinder the industry growth in the forecast span. Prevalence of substitute products such as palm oil and coconut oil based fatty acids in the region along with the scarcity of good quality raw materials may have a negative impact on the global market. Oleic acids and linoleic acids account for majority of the global tall oil fatty acid market share. Other product types include stearic acids, palmitic acids, unsaponifiables, etc., which account for less than a fifth of the total share. In 2016, oleic acids generated more than USD 350 million, and has a significant growth prospect owing to its extensive usage as an oleochemical and oilfield chemical. The product segment is gaining popularity in North America and will exhibit growth at close to 4.5% CAGR in the forecast spell. 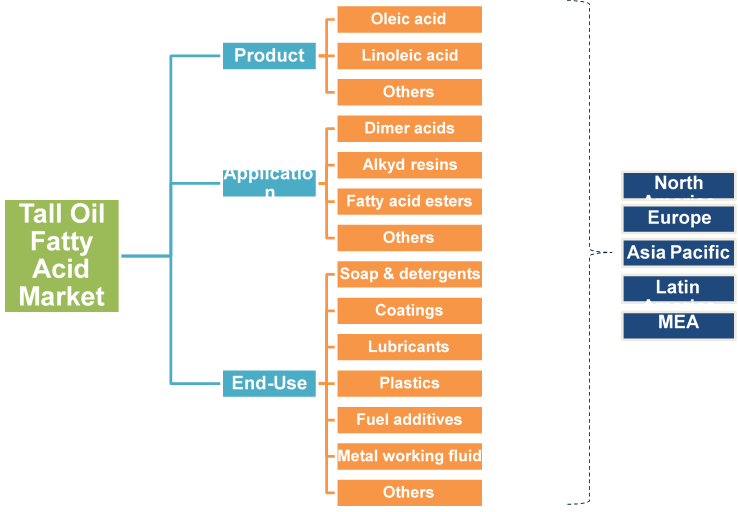 Linoleic acids accounted for more than 40% share of the overall and will witness a substantial growth in the coming years owing to developments in its end-user segments such as paints, coatings, adhesives, and sealants. Ongoing research on application of the acid in personal care products will also create a plethora of opportunities for the industry. 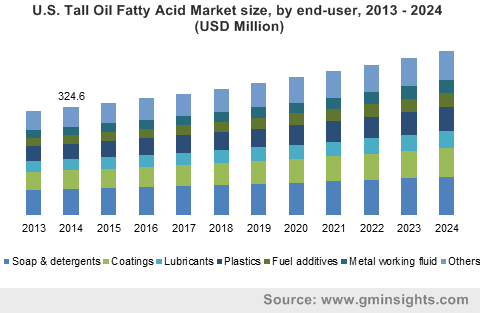 Tall oil fatty acid market application segment is based on the product use to manufacture intermediate chemicals including alkyd resins, dimer acids, fatty acid esters, and several others such as monomer acids, trimer acids, ethoxylates, and amines. Alkyd resins accounted for more than a third of the overall share and finds extensive usage in the paints and coatings industry. This application segment will likely grow at more than 4% CAGR, boosting the global market. Other uses of alkyd resins include plastic, rubber, as well as asphalt additives. Dimer acids generated a revenue close to USD 200 million for the global market in 2016 and will witness a significant growth rate in coming years. It is an intermediate chemical with a considerable use in lubricants and oilfields as fuel additives. North America oilfield sector will be a major influencing growth factor for the development of this application segment in coming years. Several end-user industries such as soap & detergents, fuel additives, coatings, plastics, lubricants, metalworking fluid, etc. find the application of the product or its derivatives. Soap & detergents industry accounted for more than a quarter of the global tall oil fatty acid market share in 2016 and will witness a sluggish growth in comparison to other segments. Lubricants and fuel additive segments combined generated a revenue over USD 150 million for the global market in 2016 and will likely witness a growth at over 4.5% CAGR in the forecast spell owing to its growing popularity as oilfield chemicals over animal derived tallow oil products. North America, led by the U.S., will likely hold sway the global tall oil fatty acid market with more than 40% of the overall share in 2016. Easy availability of raw materials and absence of substitutes in this region will characterize the regional industry trends. Increasing crude oil production in the Gulf of Mexico along with shale gas exploration activities in the U.S. will further enhance the regional market in the forecast spell. Asia Pacific tall oil fatty acid market will likely witness a significant growth at around 5% CAGR owing to increasing awareness in the region. The regional industry may face competition from other plant derived fatty acid substitutes, but growing preference for plant derived products may create new avenues for the market growth. Global tall oil fatty acid market competitive landscape is highly consolidated with the top five companies accounting to more than three quarters of the overall share. The top five product manufacturers include Arizona Chemical Company, Forchem, Lintech International, Harima Chemicals, and Georgia Pacific. Other key contributors to the market include Eastman Chemical Company, Chemical Associates Inc, Florachem Corporation, Segezha Pulp and Paper Mill, OOO Torgoviy Dom Lesokhimik, Kraton Corporation, BASF SE, Industrial Oleochemical Products, Shaxian Lixin Resin Co. Ltd, Pasand Speciality Chemical, etc. The tall oil fatty acid industry participants continuously strive to enhace their product portfolio in order to maintain their market position. They show significant integration throughout the value chain by maintaining their own plantation or having long term agreements with different plantations as direct raw material sources. Many companies manufacture the product for in-house application into end-use products such as soaps, detergents, adhesives, oilfield chemicals, etc. Tall oil fatty acid market is directly dependent on the end-user segments as well as the availability of raw materials. Raw materials principally include forest products such as pine wood and other coniferous trees. Manufacturers such as Arizona Chemical Company maintain long term agreements with plantations for continuous supply of raw materials. Growing demand from oleochemical industries in North America and Europe due to unavailability of suitable substitutes will boost the global market in the coming years. Market penetration in Asia Pacific poses challenge due to abundance of other oleochemical products such as fatty acids derived from palm oil, palm kernel oil, and coconut oil.